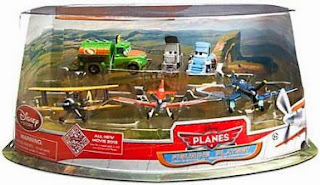 Amazon has the Disney Planes Figure Play Set for only $15.68 (reg. $39.99)! This is a great set for any Disney Planes fan. Plus it is eligible for FREE shipping on orders over $35. Follow a flight path to fun times with this set of six victorious vehicles from our Planes play figure assortment. In this package they'll find flyboys Dusty, Skipper, and Leadbottom, plus landing crew Chug, Dottie and Sparky.